I heard Bono on Sirius XM Satellite Radio recently say something about satellite stages. His band, U2, uses these types of stages, often set up in the middle of the audience, to get up-close and personal with their fans. That’s how it is for brands, businesses and anyone who uses social media for professional reasons, too. Your website is your main stage, your presence on social media your satellite stages. Use LinkedIn, Twitter, Facebook, Instagram and the like to give your own audience the opportunity to see and hear more from you as a human being, not just a corporate logo. Put yourself out there. Connect with your followers. Engage with your fans. 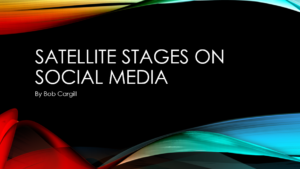 Use social media like a series of satellite stages on which you display a more believable and authentic you.